Setting up custom fields to collect additional data about the visitors. This article does not apply to input fields on the Sign-In iPad. To collect additional data on the iPad, see the article about Configuring input fields for iPad. Custom fields help you understand your visitors for better service and follow-up actions. Custom input fields show up in the Service View in the Add and Edit menus. NB! 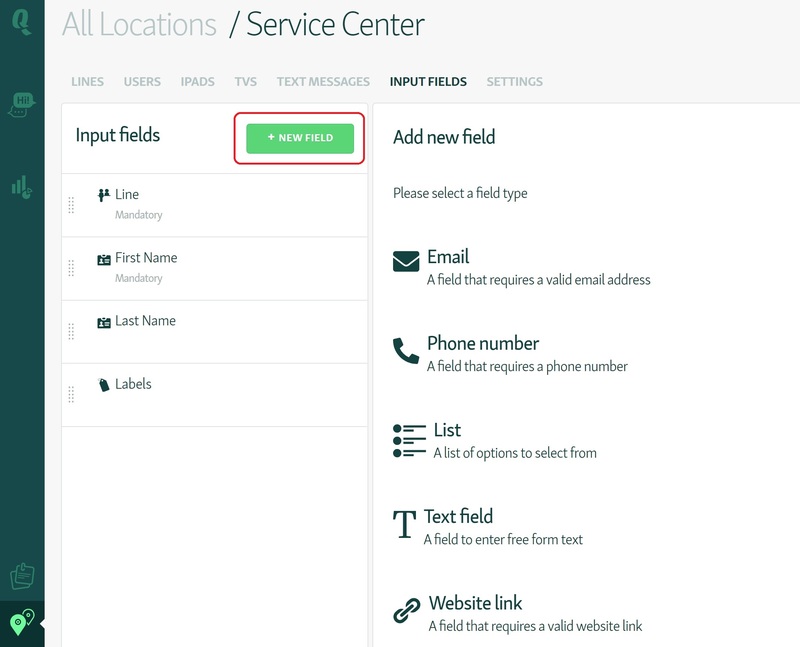 By setting up custom fields, your clerks can fill in detailed information about your customers. All of this data can then be exported into Excel from the history page. This can be especially valuable for managers as it allows them to view and analyze all of that gathered data in Excel. To access the input field settings, go the the Locations tab and click on the location's name which settings you wish to change. On the next page, choose Input Fields from the menu. To add a new input field, click the green button +NEW FIELD. On the right side of the screen you can choose what kind of input field to add. Website link allows relevant links to be saved to a visitor. 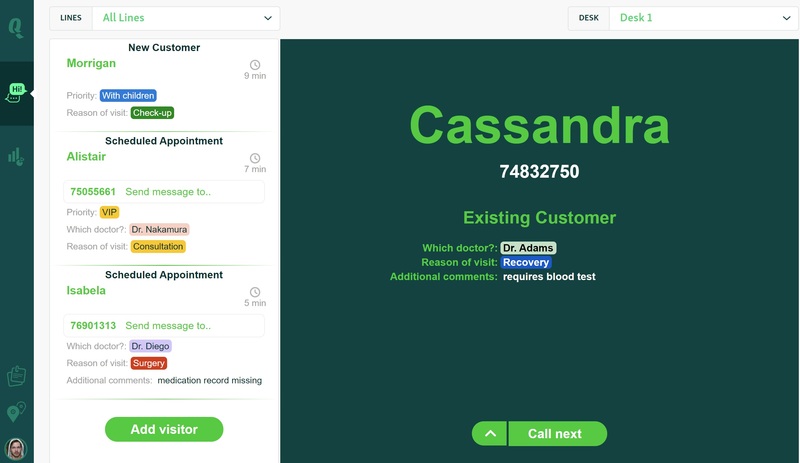 An example hyperlink could be an internal CRM profiles, added automatically via custom API integration. The above image shows how the selection of premade answers for the List type input field will look like in the Service View. If the number of different answer choices is 12 or more, the selection windows will also have a search bar. When adding a new field or clicking on an existing one, the settings page will let you modify the input fields. 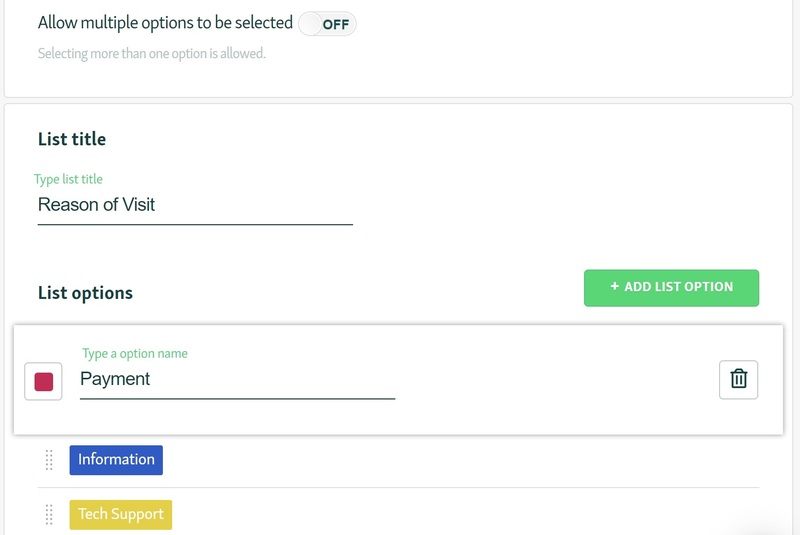 By enabling Mandatory option, this input field always has to be filled while adding or editing a visitor. By enabling Only visible to specific lines, this field will only be visible on specific lines. You can select which lines in the field next to this option. By enabling Allow multiple options to be selected, clerks can select more than one option as the answer. By clicking +ADD LIST OPTION, you can add answer choices. Reorder input fields by clicking on the dotted icon in front of the option. Drag and drop it to move its order. RENAME the option by clicking on its name. CHANGE COLOR by clicking on the square in front of the option. DELETE the option by clicking on the trash can icon.